I wrote this piece in August 2016 and during the past week it received its 1,000 view. It has always been a popular piece ever since I wrote it. In fact it received its highest monthly total in November of last year. Among all our human experience it is rejection that is among the hardest to deal with. It is as if someone has looked hard at what we truly are and then cast us aside. But for Éowyn Aragorn’s rejection marks a key moment in her journey of self-discovery and without it she could never have made it and never achieved the happiness that she will find. As always I would love to hear from you and so do leave a comment if you can. Bilbo and Frodo Were “Meant” to Have the Ring. The Hand of Providence in The Lord of the Rings. Frodo is disgusted by the story of how Sméagol had murdered his closest friend, Déagol, and taken the Ring and so began the journey from being a hobbit to becoming the “loathsome creature” that Bilbo had encountered deep beneath the Misty Mountains many years before. Gandalf tries to engage Frodo’s sympathy for a fellow creature but at this point in the story he has little success. Frodo even finds it difficult to believe that Gollum might have been a hobbit like him. We cannot really blame Frodo for his reaction to Gollum and in a further reflection that will be published soon we will think about how we learn to pity another. Frodo has to go some distance yet down the road of experience in order to learn pity and it is not only experience itself that teaches. Gandalf and Sauron are both Maiar and so belong to the same order of angelic being with the same long experience of time and all its sorrow and joy. And yet while Gandalf has learnt Pity Sauron has entirely rejected it. Among the Valar, the Divinities of Tolkien’s legendarium, Gandalf sought out the Lady Nienna as his teacher while Sauron sought out Melkor who became Morgoth. Consequently Gandalf never achieved the power that Sauron did but he did learn Pity and Patience which were to prove to be so much more important. One of the most important things that Gandalf learnt through his long practice both of Pity and of Patience was the ability to discern the significance of small things. Whereas Sauron could think only in terms of the exercise of his own will and whatever might aid or frustrate it Gandalf could see the exercise of another hand in history to which he must pay close attention and that this hand is as likely to work through small things as through great. When he speaks of the Ring being found “by the most unlikely person imaginable” Gandalf is speaking of the work of this hand. Gandalf is capable of discerning that “something else at work” in the astonishing moment of chance in which Bilbo places his hand upon the Ring because of his long practice of paying the closest attention to things. And when we speak of things we are not speaking of those things that are generally regarded as important but of small things. Things like hobbits. Gandalf expects to see the hand of Providence at work in such things. Sauron does not look for the hand of Providence at all. The direct intervention of the Valar at the end of the First Age and that of Eru, the One, when Ar-Pharazôn of Númenor attacks the Undying Lands, takes him entirely by surprise. But that he might fall because of hobbits is a possibility that could never have entered even his darkest thoughts. You require certain powers of imagination in order to see Providence at work and Sauron not only has no imagination but he despises it. It is necessary to have imagination in order to people the world with hobbits and dwarves and ents. Sauron, like his master, Morgoth, before him, can only think in terms of slaves and of usefulness. Oh, the limitations of the practically minded! Those whose careful cost-benefit analyses can only be constructed in terms of profitability. Those who are prepared to declare whole peoples useless and to construct realities in which the useless no longer exist. Those for whom trees have only value as a carbon based energy source. Those who can only look at land as potential real-estate. At the last they must fall before the playful, the imaginative and the foolish. Gandalf is accused of being trivial in his love of pipe-weed, fireworks and hobbits and accused of madness in entrusting the Ring to a “witless halfling”. But he has seen something that others have not. That no-one can simply abandon the Ring (or cast it into the Fire for that matter) unless another hand is at work and he has discerned that hand at work in the hobbits, Bilbo and Frodo Baggins. And that is an encouraging thought! I wrote this piece at this time of the year in 2015. It has never had a lot of readers but I enjoyed a wonderful conversation in the Comments section with those who did read it. I think that it is worth reading for that alone but I offer it to you with my greetings at this Christmastide and if any of you would like to join in the conversation I would be delighted to read your thoughts. If I were to keep to my usual practice and to reflect on a passage from The Lord of the Rings as I read through the story then I would have to end the year, and to keep Christmas, with Frodo and Sam in Shelob’s Lair. I could not do this. Tolkien himself used December 25th as a day of hope in his story, the day on which the Fellowship left Rivendell to begin their mission. The dereliction of Shelob’s Lair comes later when Sam believes Frodo to be dead and wrestles with the choice of whether to leave him and to carry on the mission alone. We will reach that point in 2016. I could not spend Christmas thinking about it. A few weeks ago I celebrated the first post on my blog to have been viewed 1,000 times. It is entitled A Chance for Faramir, Captain of Gondor, to Show His Quality. If you look at Top Posts and Pages in the column on the right of this page you will find a link to it there. Today I wish to celebrate the second of my posts to achieve the same distinction. Actually allow me to confess. It has been viewed 997 times but I hope that by the end of the day that will have become 1,000! It is a piece that I remain pleased with. It expresses two things. 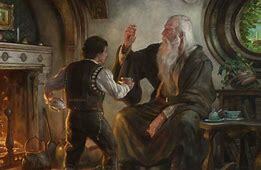 One is the importance of small things in The Lord of the Rings and how wisdom is shown in paying attention to them. Another links to a recent conversation on the blog about how Sauron, the great planner, tends to overlook small things. Olga Polomoshnova made this point in a comment on my post, Why Did Sauron Make the Ring? And the post that I hope you are about to read also gave me the chance to thank one or two othere who have been regular supporters of the blog. Conversation is one of the joys of blogging and it has contributed so much to deepening my understanding of Tolkien’s work. Gandalf Speaks of How Sméagol Took the Ring and So Became Gollum. Gandalf is answering a question that Frodo asked him fearfully and desperately. Frodo is speaking of the Ring of Power forged by Sauron so that he might become lord of all the earth. In a few short minutes Frodo has journeyed from being a hobbit enjoying a comfortable if rather a dull life to one at the very centre of the great events of his age. He has already protested against the apparent injustice of his fate. If Gandalf had invited him to be a part of an adventure he might have responded with more enthusiasm. To go on an adventure would have been a conscious and carefully considered choice, although when Bilbo made that choice it had to be done in haste before the possibility passed him by for ever. 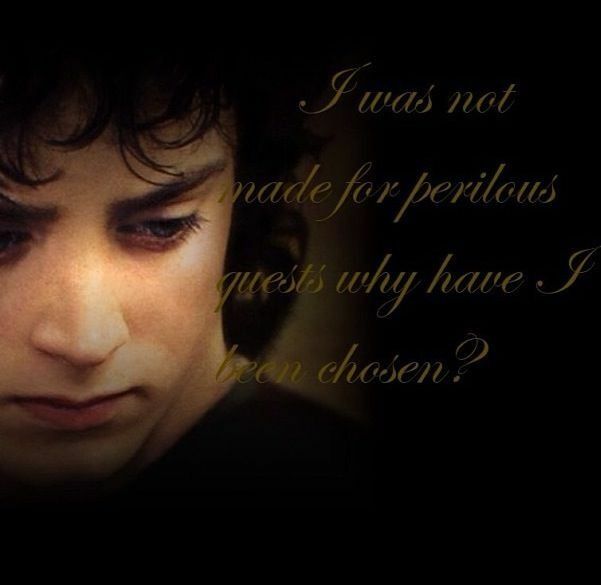 Frodo is given no choice. The Ring has come to him and its maker is searching for it. And so Gandalf gives him a brief overview of the history of the Second and Third Ages, of the evil desire of Sauron and the brave resistance of Elendil of Gondor and Arnor and Gil-galad, the High King of the Elves. He speaks of how Isildur, son of Elendil, cut the Ring from Sauron’s hand but how he failed to destroy it, eventually losing it in an orc ambush in the Gladden Fields in which he lost his life. He tells Frodo how the Ring remained hidden for long years there until it was found by hobbit like creatures near their ancestral home. The Ring was found by Déagol, friend of Sméagol, a friend, that is, until the moment in which Sméagol murdered him because the Ring “looked so bright and beautiful”. And so began Sméagol’s unhappy career as a creature of power and menace, a career in which he began as a hobbit and ended as Gollum, a name given to him in contempt by his fellows but one that eventually he took for himself, or at least for that expression of himself that was entirely under the power of the Ring. In Peter Jackson’s films we are given the impression that Sméagol’s decision to murder his friend was because of the overwhelming and entirely malicious power of the Ring and it is true that the Ring plays a key role in the whole unhappy affair. But Tolkien would not allow so simple an explanation. Before the moment of the Ring’s discovery and the murder, Sméagol had a career. We learn that he “was interested in roots and beginnings; he dived into deep pools; he burrowed under trees and growing plants; he into green mounds”. In other words he was a scientist. Now before all the scientists who are among my readers cry out in protest let me say that I do not believe that Tolkien was against the scientific method in and of itself. What he tried to get us to see is that knowledge can never take the place of wisdom. Poor Sméagol may have learnt all that there is about the roots and beginnings of things but he never learnt how to find love, or joy, or peace. He may have stolen a tool that could give him power but he had to trade happiness in order to gain it. As Gandalf was to say later to Saruman, those who break a thing in order to find out what it is leave the path of wisdom. Sméagol, like Saruman, was a breaker, a manipulator, and a fool! Sméagol’s journey took him deeper into the roots of things, away from the warming sun, the gentle breeze and the kind company of friends and kinsfolk. He went down into the tunnels underneath the mountains, down into the dark. It is the inevitable end for one who chooses power over others in stead of the service of others. The dark may not be physical as it was in Sméagol’s case but it is utterly isolating. It is the reality that comes when someone turns inward, centreing only upon themself, turning away from others. But at last a moment of grace broke into Sméagol’s dark world in the form of a hobbit who was utterly lost. But would Sméagol recognise it when it came? My message to Europe: tell us you want Britain to stay. An Plea From Timothy Garton-Ash. I have long been an admirer of Timothy Garton-Ash ever since I was introduced to his work by German friends some years ago. I think that his reflection on the relationship between the European Union and Great Britain is both correct and timely. I think that the European Union has a choice to make, as does Britain. Will it choose to be merely a bureaucratic arrangement in which the members of the club pay their bills, keep the rules regarding free movement of goods and services and of people, but apart from that are free to honour or to dishonour the rule of law or will it choose to be a truly democratic institution? I believe that in its original concept the European Union was a rejection of the politics of the past in which each European nation sought to further only its own interests, a politics that led ultimately to two world wars. It was also a rejection of the dictatorships of Europe both of the Right and of the Left. And if Europe wishes to remain true to that founding vision then it needs Britain to play a strong role. For all its faults Britain remains one of the strongest democracies in Europe if not the world. Why Did Sauron Make the Ring? Gandalf in Frodo’s Study at Bag End. In 1949 Herbert Butterfield, Professor of Modern History at the University of Cambridge, published a series of lectures that he had given under the title of Christianity and History. I do not know if he had any contact with The Inklings. He was a Cambridge Professor and they were based in Oxford. But I rather think that Tolkien would have approved of Butterfield’s thoughts contained in this quotation from those lectures. When I asked whether Butterfield and the Inklings could have known each other it was because it seemed to me that Butterfield could have been describing the action of Sauron in the forging of the Ring. That Sauron imagined himself, not only as a king of the earth, but as the king. Sauron forged the Ring in order to achieve kingship, declaring his intent in the words that he inscribed upon it. Sauron is one who fears disorder; one for whom order is only certain when he is in absolute control. This means that all other powers, even and perhaps most especially Providence itself, must first be found and then bound in the darkness. And why the darkness? Because the light is not under his control and the light is able to penetrate even the most carefully constructed of his defences. The same goes for the unruly weather. The wind blows where it chooses and you hear the sound of it, but you do not know where it comes from or where it goes. So it is with everyone who is born of the Spirit. And Sauron fears those who are born of the Spirit, those who are truly free, who will not bow the knee to him; and so he labours endlessly to corrupt the free and to bind them to him for ever. It is the Ringwraiths, the Nazgûl, who are the most tragic of these people. They are those who traded their freedom in exchange for power and so as Gandalf expresses it heartbreakingly, they became “shadows under his great Shadow”. It is hard to imagine any image that could convey the sense of something or someone who has less substance than a shadow within a shadow. This is the end of all who seek power and control and who grow to fear freedom above everything else. Butterfield describes Sauron so well when he speaks of one who is farsighted in the wrong way, someone who seeks to eliminate all unpredictability and risk from the future. As Butterfield puts it, someone for whom “there must never be a single mistake”. Compare such a spirit to the astonishing risk of putting your trust in hobbits! Perhaps this is a moment to consider how great a risk this is. Later in the story Denethor, the Lord of Gondor, will declare Gandalf’s trust in hobbits as madness and the hobbits themselves as witless. Gandalf does not argue with him or try to justify his trust. His choice is the worst that could possibly have been made. Except, that is, for every other choice. But the same quotation from Butterfield that opened this short reflection goes on to describe the choice that Gandalf does make and the one that Frodo accepts and makes his own. This is what Gandalf and Frodo speak of on that Spring morning in the Shire. Not some vast plan to solve all the problems of Middle-earth but the decision to take one course of action. And at this point the action is only to take the Ring out of the Shire because the Dark Lord now knows that the Ring is there. The first choice to do good is very limited in its scope because at this point Frodo and, even, Gandalf himself does not know what to do next. But it is enough. The lump of dough will be leavened beyond all imagining. Faramir and Éowyn Begin to Fall in Love and the Healing That This Brings. Gandalf Teaches Us that the Just Shall Live by Faith. Sam Gamgee Sees Something More Real Than the Shadow.